Own-goals are either utterly hilarious, completely unfortunate or just plain stupid from the guilty party. This one from Germany’s Bundesliga in 2014 is both unfortunate and hilarious. It’s a unique but beautiful blend for the viewer. So much so, you’ll want to watch it again, and again, and again. 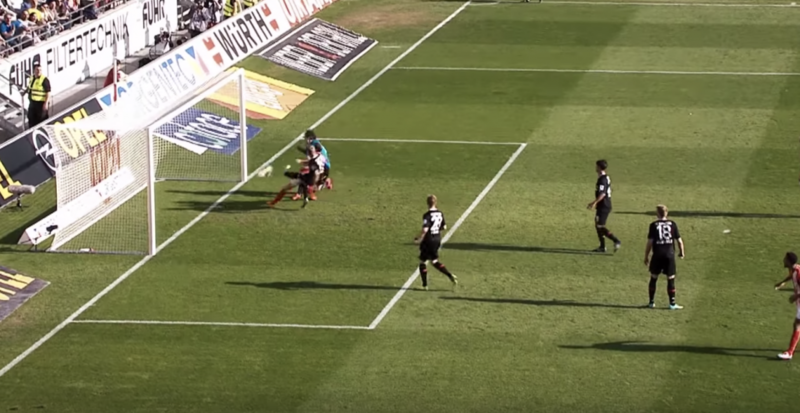 During a league match between Mainz 05 and FC Augsburg, Augsburg goalkeeper Marwin Hitz tipped a shot from just inside the 18-yard box on to the post, but soon found himself in the way of the resulting clearance. The ball smashed him in the face and rebounded straight into the net. Poor sod. Previous: Previous post: Premier League Competition: Win a 2018/19 Premier League shirt of your choice courtesy of Bet and Skill! Next: Next post: Watch: Did he really mean this 30 yard back-heeled overhead kick?